Many gas furnaces in operation today still have a continuous pilot flame. Turning off the pilot flame in the summer is easy to do and well worth the effort, but very few people do it, either because they don’t know how or aren’t aware that they should. Once you are familiar with the procedure, it only takes about 2 minutes per year to to do and will save anywhere from $30-$60 per year depending on your furnace, your location, and gas prices). It will also reduce your greenhouse gas emissions by 0.15 to 0.30 tons per year. I live in a moderate climate (Vancouver, BC, Canada) and only require artificial heat about 7 months of the year (from mid October to mid May). For the other 5 months of the year I turn my furnace off completely, including the pilot flame. There are occasionally some cold days during that period but we’ll usually just wear extra clothing and leave the furnace off. Throughout much of the US the heating season is shorter and your potential savings are even higher. To turn off your furnace completely, look for a valve in the gas line to the furnace. 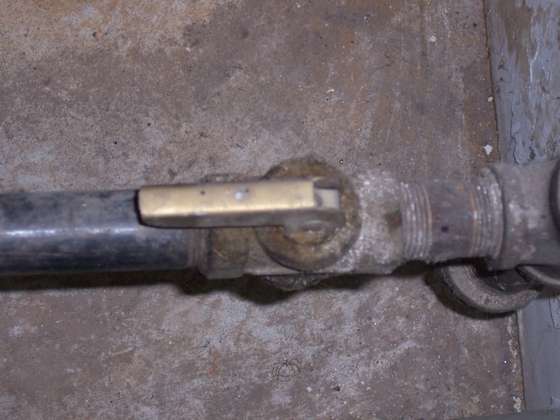 Simply turn the valve handle so it is angled 90 degrees to the pipe as shown below. If you like, you can check your furnace to ensure the pilot flame goes out. Note that there is no danger of a gas leak if someone inadvertently turns the gas back on. There is a thermocouple sensor in your furnace that will prevent gas from flowing if the pilot flame is out. To turn your furnace back on, turn the valve handle parallel to the pipe as shown in the second image above and re-light your pilot flame following the furnace manufacturer’s instructions. If you don’t have the manual for your furnace you can probably look it up online or follow the general instructions below. Press and hold the thermocouple bypass button (otherwise no gas will flow since the thermocouple will detect that there is no pilot flame). While holding down the bypass button, hold a lit lighter or match at the location of the pilot flame. If the gas valve has been turned off for several months, there will be air in the pipe and it may take some time for this to be expelled before the pilot flame lights. After the pilot flame lights, continue holding down the bypass button for 30 seconds or so to allow the thermocouple to heat up. Then release the button. If the pilot flame goes out when you release the button, try lighting it again and wait longer. If you still can’t get the pilot flame to stay lit without the button depressed, there’s likely something wrong with your thermocouple. That’s all there is to it. If you really want to save some money, consider switching to electric space heaters. In spite of the apparent higher cost of electricity, you can save money because electric space heating is so much more efficient than combustion based central heating methods. This also adds life to your furnace by reducing the corrosion caused by the moisture from the pilot light exhaust. I forgot and left mine on this summer. I vaccuumed a lot more rusty scale out of the burner area than I did last year when I turned it off. I use a vacuum to clean out the burner area in preparation for the heating season. This is another easy way to make your furnace more efficient and less likely to produce carbon monoxide. Very good post! 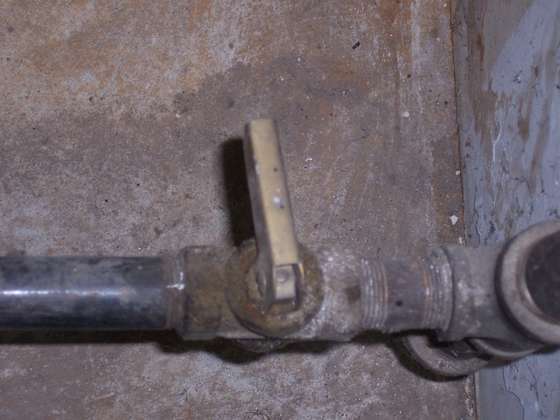 One other thing we try to do anytime we turn a gas valve on or off, is to take a bottle of soapy water and spray it around the valve, looking for small leaks. Good post! Bookmarked and will share with my own readers! Even though electric heaters are theoretically 100% efficient, they actually use a lot more energy due to the inefficiencies of electricity production and distribution. For electric space heaters to make sense, you have to be heating a small area compared to the entire building. You wouldn’t want to heat your entire house with several space heaters. If you leave your furnace off and move a space heater to wherever you need it, that could have savings. Now time to turn on my pilot light! Yes! I turned off the pilot to my gas log set. It was pretty worthless because its a vented gas log setup… It produced very little heat. I also use propane for my on demand water heater. I was amazed at how much longer my propane lasts! That little pilot flame can burn up a lot of gas. 7200IPER valve not 720IPER. 720-07J can be found for $30 used on ebay. No I am not an hvac pro, but I did stay at a Holiday Inn Express. Fact is you can become an expert on YOUR own system. I don’t know how many furnaces still use pilot lights, but many gas fireplace inserts do. And for those turning off the pilot light during the summer also reduces the heat produced inside the house. It’s a surprising amount of heat! After shutting off the gas valve pilot flame is off but due to current flowing in pilot it makes tik tik noise. To stop that we have to stop d c power. How? My basement area near furnace has caused me to have a burning sensation down my throat. I have my pilot light turned off as I have turned off my heat. Could there be gas leaking. I’m a little freaked out by turning it on again. It’s quite an old model. Anyway I barely use it. The heat in my basement suite has reduced substantially. For Carol, call someone to check. Your natural gas provider though natural gas smells like rotten eggs. Dont take a chance with gas. Hello, I am a professional fireplace service technician in the Cleveland, Ohio area. I know this is an older article, but for what it’s worth, here’s my two cents. For any type of enclosed fireplace, this is generally not a great idea. You don’t spend much keeping that pilot lit, typically they are very small (of course there are exceptions). Especially for direct vent units, which really don’t have a damper. The pilot light actually prevents moisture from building up in the (enclosed) firebox, which can cause some major issues. Just today I replaced a pilot assembly that crumbled to pieces while I was cleaning it, and nearly every component on the inside of the box (wires, brackets, etc.) Was corroded or falling appart. This unit was only 4 years old, and they left their pilot off throigh 3 seasons (until it got cold). This is an extreme situation, but I’ve seen it happen more than a few times, and very often to a lesser extent. The pilot can also help discourage spiders from getting in and blocking up the pilot line, which happens more often than you might think. This is usually simple to fix, but it can become more involved depending on what’s stuck in the line. Pilot lines are extremely small on the inside. If something breaks, service calls can cost between $100-150 per hour, plus parts and tax. Long story short, keeping the pilot on will cost slightly more per year in gas, but may extend the life of your fireplace and prevent costly problems. I came across this article after having an in home furnace for the first time. From the information I’ve read it sounds like turning off the pilot light when the furnace is not in use for long periods helps extend the life of the unit. The issues you mention with turning the pilot light off are with regards to fireplaces and not necessarily home furnaces, correct? I ask because where I live the furnace would only need to be in use for ~2 months a year and I would like to keep the pilot light off during the remaining months as long as it won’t cause damage in the long run.